Burn Fat! Don't store it! 44% Fewer calories than original muscle milk. 25gg Protein. Same great taste! 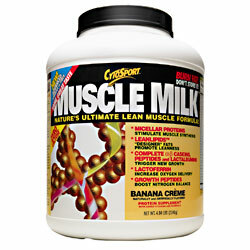 Over 50% of Total calories from Energy Sustaining Lean Muscle Supporting High Quality Protein. Advertências: ALLERGEN STATEMENT: This product contains ingredients derived from milk and soy. Recomendações de uso: For a rich, satisfying shake, mix two scoops (50g) into 10-12 fl oz of cold water. Use 2-3 servings per day.